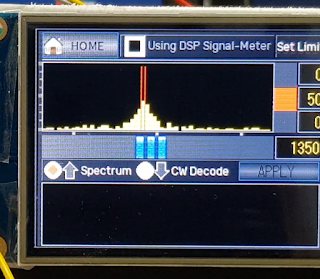 In order to view signals with Character LCD or Nextion LCD, Signal Meter Sensor must be installed. 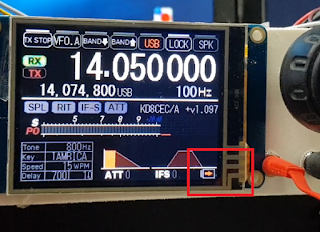 Of course, CEC Firmware operates normally even if S-meter sensor is not installed. If SSA (Standalone Signal Analyzer)'s default mode is set to Spectrum, Spectrum will be displayed on the screen as soon as power is turned on. 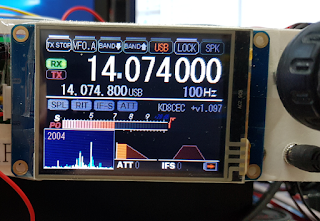 At this time, there was a problem that the amount of data transmitted from uBITX to Nextion LCD exceeded the default buffer of SSA. 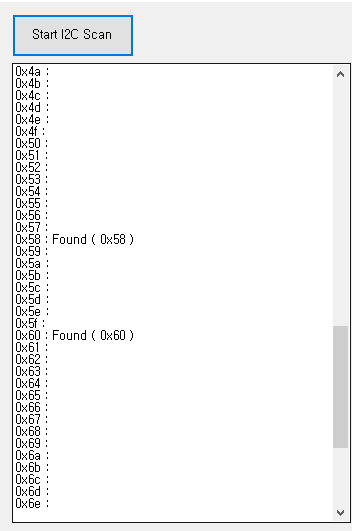 SSA 0.7 solved this problem by activating the Spectrum function after waiting for about 2 seconds after starting up. 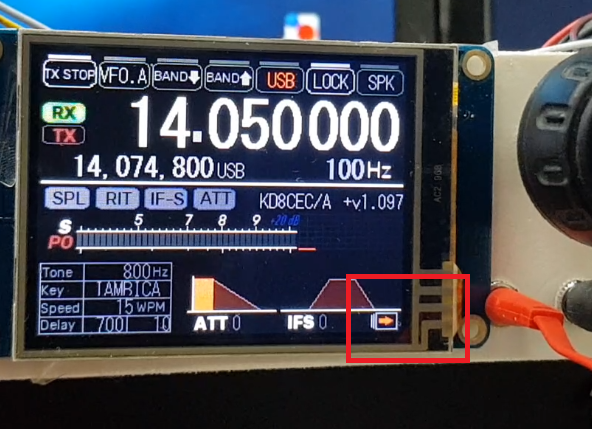 When I2C type signal-meter sensor is used, end of filename ends with _S. This part will be posted separately. You should not use it in general. 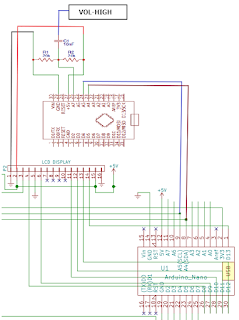 If your I2C address is not 0x60, you can modify it here. 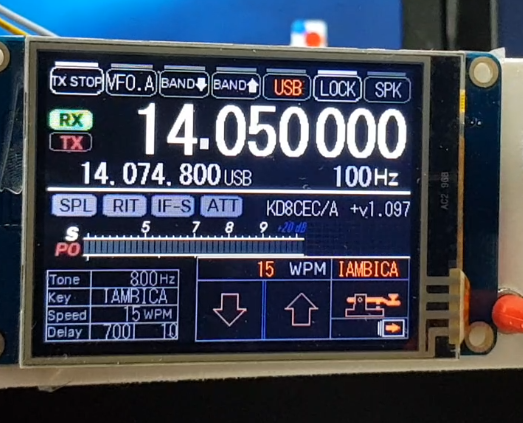 3.7 Nextion LCD and TJC LCD can display Spectrum and CW Decode. 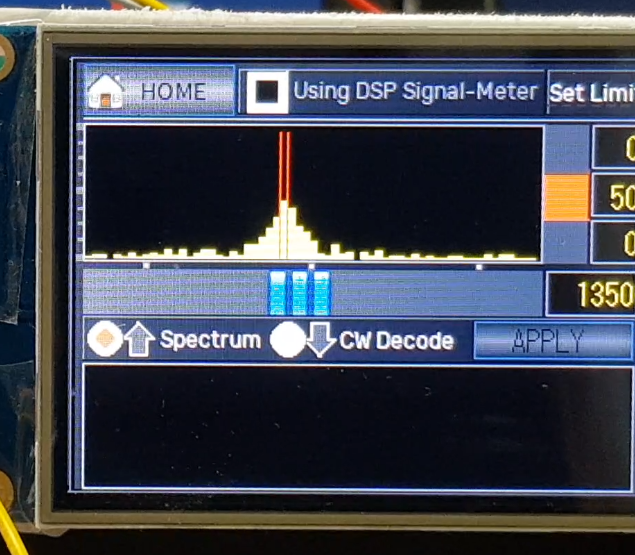 To use this feature, you must use the Standalone Signal Analyzer. It was an idea from the bitx group two or three months ago. I have added an option to deactivate each function in the source code. This version is probably the last version of the beta version. I am going to fix the bug and redistribute it to Version 1.1 if the problem does not occur. I am always thankful to developers who are developing at different resolutions of Nextion and TJC. 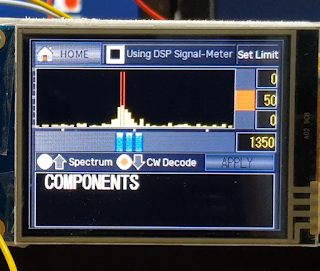 Thanks for the great work Ian - One problem - the Download link to the "Standalone Signal Analyzer1 (I2C Type Signal-Meter) V0.5" hex file points to the MM1.097.zip, by mistake? 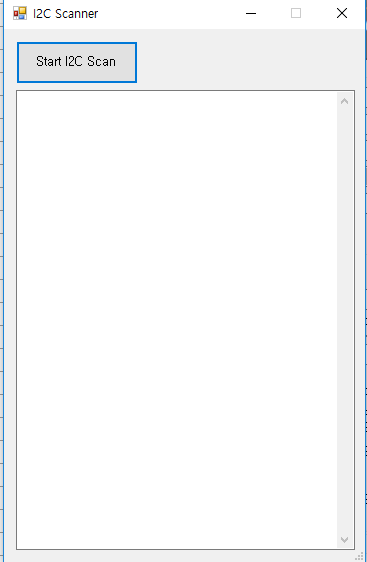 I can't download the Signal Analyzer hex file. The link for the source works. I fixed it, you can download 'Standalone Signal Anylzer1' now, please try agian. Gregory Keys. Thanks for another solution. 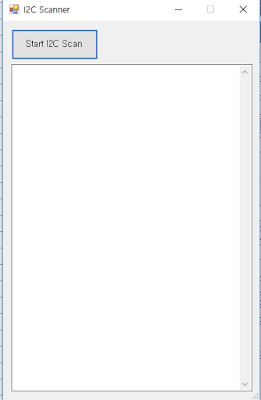 I am sightly confused with this description appearing in your source file ubitx.h. The confusion is in the Clock output pins on this header. All schematic show it as CLK2 - CLK1-CLK0, but you have shown it reverse. Is this a typo or is this factual. 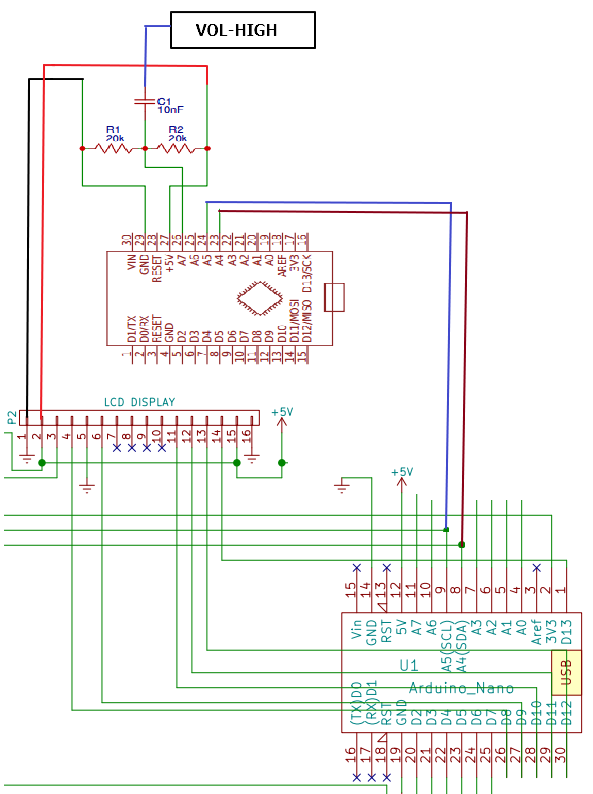 * The second set of 16 pins on the Raduino's bottom connector are have the three clock outputs and the digital lines to control the rig. works great, tnx for the CW options. Ian, thanks again for all the work you put into this development!! I am at work right now, so can't get this installed on my uBitx until tonight. I also have to build the 2nd arduino circuit. I have copied all the files I need, the firmware upgrade, the Nextion tft files for my 2.8 display (well the whole file set), the uBitx Manager updated software and the Standalone Signal Analyzer to a thumb drive. Again appreciate all this work that you have done. Really glad that now when I want to work CW and choose which key type I want has been made easier to get to. When you have time, please test and let me know. I would probably end the beta with this version. Will do Ian. Been cutting grass and cleaning up around home. Will try to get everything done and tested I hope by the weekend. 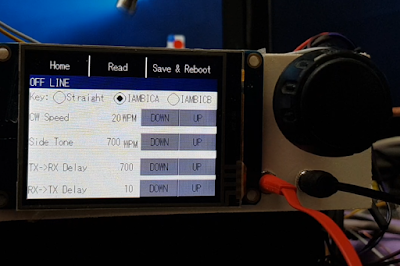 I also built the Arduino Nano S-meter, but reversed back to older version and de-soldered everything because I was mixed up how to configure it in Ubitx Manager. I piggypacked both Arduinots to avoid electrical noise and/or long signal lines. However the set-up makes hell of a noise when turning the VFO, hiss, pop and crash. 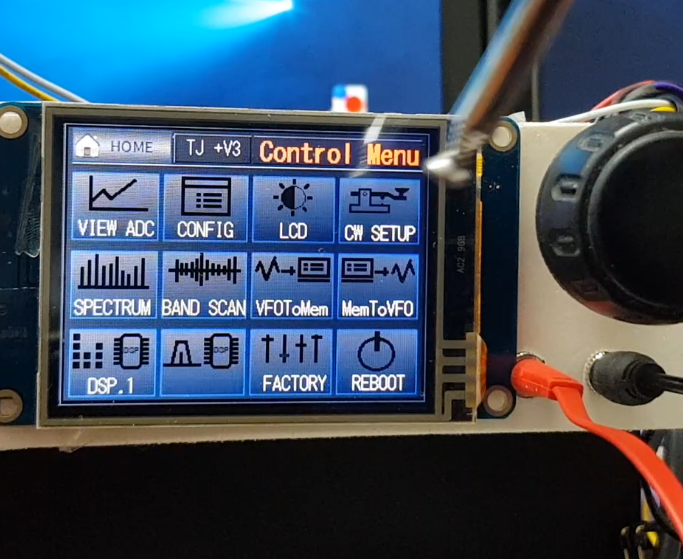 Is it due to i2C communication or what? I appreciate Ian's genius work but at this stage I feel a bit tired. 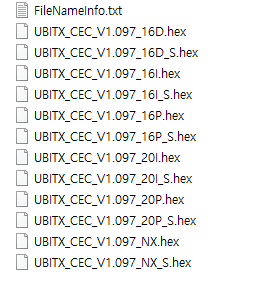 I have helped other fellow hams to upgrade their Ubitx radios and found out that SEARCHING for software files is quite hard. them easily. This is just a humble plea. Thanks for testing and comment about that. Noise => there are two places where noise occurs. The first is the communication line. Second is LCD. 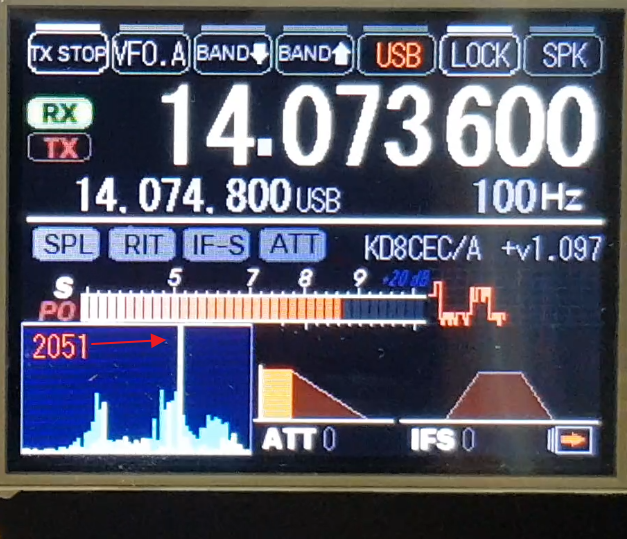 If you hear 'tick, tick' when you turn the VFO, this is the noise that appears when communicating. 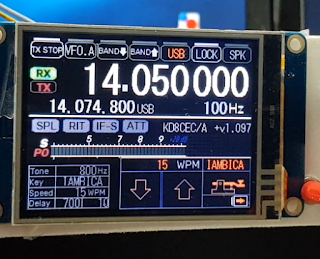 Actually, now I also hear 'tick tick' sound when uBITX remove the antenna (To create a quiet environment), increase the volume, and dial the VFO knob. It is not a big problem for me and I am using it as it is. I have a few things to experiment with about this. I'll post it if I can experiment later and get better results. The second is the noise from the LCD. This will continue to generate noise, mainly in the Spectrum mode. This is the noise that occurs even in normal times, which is an obstacle to communication. 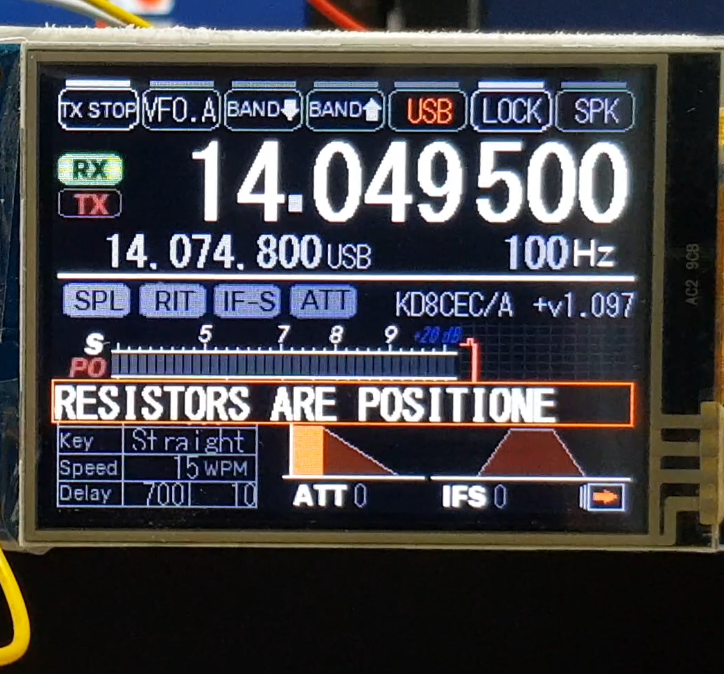 Connecting a 5ohm ~ 15ohm resistor in series with the + 5V line on the LCD will disappear cleanly. For this, I posted it on the link below. I have also tested transmission and confirmed that it is being transmitted cleanly. I think these things can work together to make a better radio. I also post the explanatory material first and then release the version to avoid confusion. When publishing the description material, I will add a pre-distribution phrase. 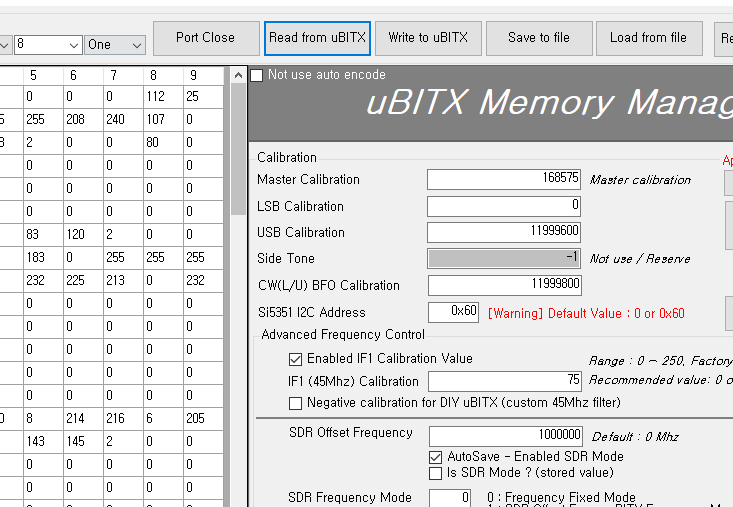 Hello, have a problem with my uBitx LSB/USB modulation. Up 10Mhz must be USB modulation, below 10Mhz - LSB. in my case is reverse: example. 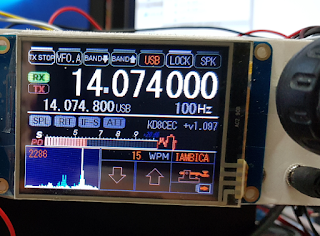 if I want to hear clear signal in 14Mhz I must to switch to LSB modulation,or in 7Mhz - USB. Where is the problem? Thanks. If you tell me when your firmware version and its symptoms have appeared, I will be able to make a more accurate judgment. 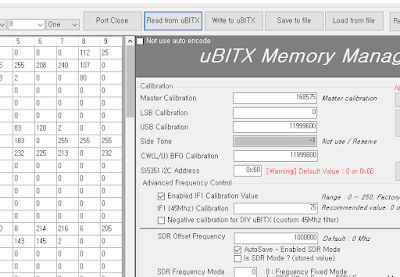 If you send your uBITX backup file, you can judge it more accurately. But I have seen a lot of such symptoms. Most of the symptoms were after trying to calibrate. Do not worry. 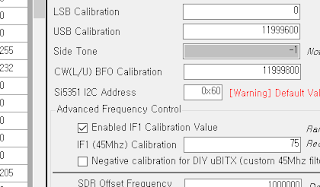 In most cases, the calibration value is wrong. Please follow the link below. If not, please send uBITX backup file to me. To add one more explanation, if you were normal before you updated the CEC Firmware, you could easily get back to the original state. Looking for the source code. Thanks! Hello Ian, here most things work very well with the new firmware. Many thanks! keyer that produced good results. Often there is not even change from rx to tx. 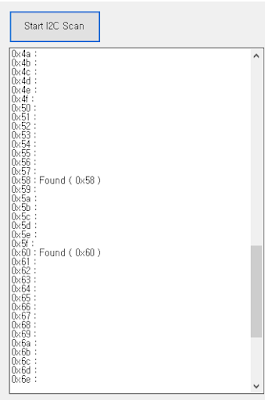 Ian...I have downloaded the 1.097 firmware, unzipped it, and uploaded the 1.097 NX S version onto Raduino. Everything appears to work normally, and the Home page correctly displays +v1.097. However, when I switch to the control menu, there is no DSP button...what have I done wrong?? 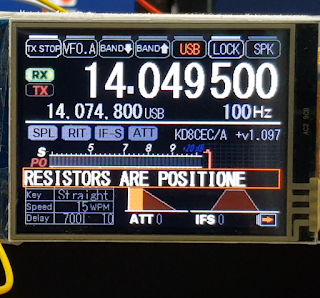 Ian, I'd really like to see a voltmeter reading incorporated into the TJC/Nextion touch screen home display for use during battery power operation. I've devised a possible way of making double use of the A3 input, currently being used only for the PTT discreet. If a 220K resistor is connected from +12V supply voltage input to the A3 input of the Raduino and a 100K resistor from the A2 input to GND, this should provide a voltage of approximately 5 volts at A3 when the supply voltage of 16VDC to allow for an indication for if the supply exceeds the 15VDC maximum voltage rating of the circuits). Since I am not a programmer it would require someone else to write the code for the reading of the analog signal to A3. Calibration of the input would require only the input of a user supplied meter reading and the analog reading of A3 (possibly automatic). It would be nice if this entry could be made through a screen accessed through the "Control Menu" (I've noticed there is an unused button on this screen). 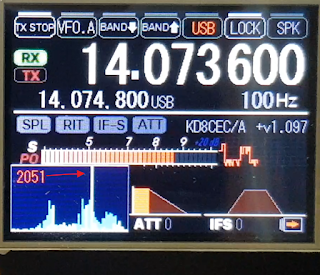 + When the "TX STOP" button has been activated before going to the "Control Menu" and making changes in the "CW SETUP" screen, when returning to the "HOME" screen the radio will transmit, even though the "TX STOP" button still shows active ("STOP"). Also, when the radio gets into this mode, the "STOP" cannot be selected off. + Both "IAMBICB" key mode does not seem to be working, it is the same configuration as the "IAMBICA" selection (tip = dit, ring = dah). Regarding my comment about the adding a supply voltage monitor, the software version number could be moved to the "Control Menu" screen and the supply voltage reading could take its place on the "HOME" screen. Great work, thank You Ian! get full 3.5 coverage? I would try to make it myself but TJC editor is Chinese only. Or should I go for a smaller display? Just a note. After connecting the Nextion I found the touchpad working but not communicating with the rarduino. 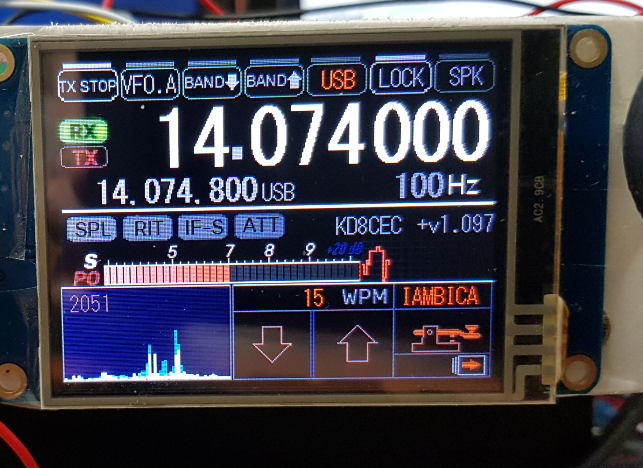 The reason is that the Nextion has a default speed of 38400 baud, forced to 115200 during the flash procedure. But if the firmware doesn't initialize in some way (and it seems that this initialization is missing) it is necessary to use command bauds=9600 (bauds not baud that set the speed also after power reset https://www.itead.cc/wiki/Nextion_Instruction_Set ). I used nextion IDE to write on it, but it should be possible also via terminal . I am mvs sarma vu3 zmv. I am making a change in IF from present 12MHz to 9MHz. 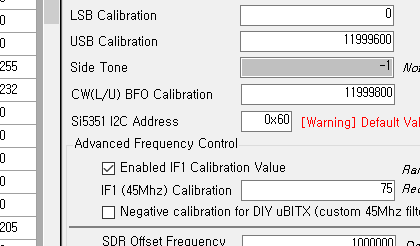 I could change the IF carrier, USB and LSB values to suit. But i would like to use s-meter. The published .hex codes work for 12MHz. Please try if you could suggest changes in source code for re compiling the code for 9MHZ if Mod.